Infectious Disease - Outbreak at Lee High School - That's Sick! there was a visitor waiting for her. Jim Yoder, of the Epidemiology Branch at the public health department laboratory, was leaning against the wall outside Dotti's office. He had a worried look on his face. Jim was a bit of an introvert so seeing him outside her office set off alarm bells for Dotti. He did not usually come down to see her unless it was something really important. Dotti started to get a little worried. As she approached her office she could feel her shoulders involuntarily slump in preparation for what she knew must be bad news. 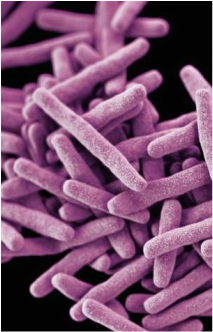 Electron micrograph image of a cluster of rod-shaped drug-resistant Mycobacterium tuberculosis bacteria. At 37, Dotti Lesak had already been working at the Fairfax County Department of Public Health for 13 years. Having trained as a medical technician, she loved working in the public health laboratory where she was a bench scientist. Dotti’s favorite part was being a part of the public health team to identify potential outbreaks of tuberculosis and provide laboratory results so patients could be treated with the right drugs. She recently noticed an uptick in the number of samples submitted from young people in Fairfax County, and even more alarming, were the two positive TB cases the laboratory found among this group. She assumed Jim was there to discuss those cases. “Good morning Jim, what can I do for you?” She tried to sound cheerful but the worried look on Jim’s face made her heart race; her attempt at cheerfulness was feeble at best. This was not news Dotti wanted to hear, and her deep sigh gave away the disappointment that she felt. Dotti’s mind was racing with questions but she knew she had to take a deep breath, sit down with Jim, and start answering the questions one by one. Hearing the positive words from Jim provided reassurance for the value of the work Dotti was doing but hearing about cases at a local school really troubled her. There were potentially a lot of kids to test and a lot of kids to worry about. just under the skin. If there is redness and swelling after a few days, that indicates an active infection. Dotti and Jim sat in her dimly lit office to compare notes. Two of the cases had no link to Lee High School, but the other two cases were students within the last school year. Dotti assumed that this outbreak was not finished and that she had more work ahead of her. Sure enough, later that week, the laboratory reported newly positive results from samples in young people. These new cases were not among the 430 tested students; the epidemiological net needed to be cast much further. Jim Yoder told Dotti her suspicions were well-founded. Dotti knew this news was a potential source of panic at the school and within the community. Dotti assured Jim that the public health laboratory would do everything they could to provide test results as quickly as possible to help stop the spread of TB and to alleviate the fears of everyone at the school. X-ray photo of the lungs of a patient with tuberculosis. 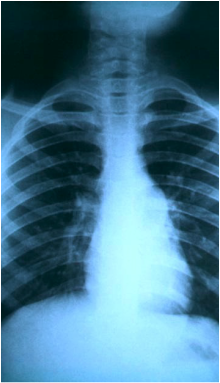 In a healthy patient, the area around the ribs would be completely clear without the cloudiness. The new school year at Lee High School started and it had been three months since the last known case of TB among the students. A little over 1900 students, faculty and staff were tested for TB and all of them tested negative. There was plenty of outreach, plenty of worried parents and plenty of long days. Back in her laboratory, Dotti was proud of the work she and her team provided. She thought about how much worse it could have been. Without their help, the students could have unknowingly spread the disease to their family members, who could have spread it to others at their jobs, who could have spread it further to even more personal contacts. This story is a fictional representation of events that occurred at Lee High School in Fairfax, Virginia in June of 2013.